As I get the shop set up and build cabinets, out feed table, router table, and so on I’m going through a ton of screws. Mostly #8 – 1-5/8” through 3”. The local hardware store is a bit expensive buying in 1 pound boxes. I have a nearby Fastenal Store that I plan on visiting tomorrow and they have these Phillips/Square wood screws in larger boxes for far less per screw. So for you seasoned woodworkers, what your choice in fasteners? Favorite supplier? I just did discover McFeely’s and ordered some “7MM X 50MM RTA CONNECTING SCREW QTY: 100” which are hex head fasteners described in an out feed table plan I’m using. I buy 5 lb boxes at the home stores, HD and Lowes. I’m with Waho. I almost exclusively use spax unless there’s a specific need for something else. I’ve never seen the Spax screws. The combo square/phillips screws seem all wrong to me. When a phillips cams out, you’re left with a hole that looks like the square drive. And there’s no guarantee that square drives won’t cam out too. Give me one or the other, but I prefer the square drives. And the others mentioned are even better, of course. Most of the spax one use torx bits. I like that. Usually have good luck with those. Dan, I buy Spax at the HD. I bought 5lb bins in a couple sizes for jigs and and shop pieces and am still using them. I use 1 lb boxes for ones that I don’t always use. I don’t use screws usually for many projects but have no problem for most shop furniture or jigs. 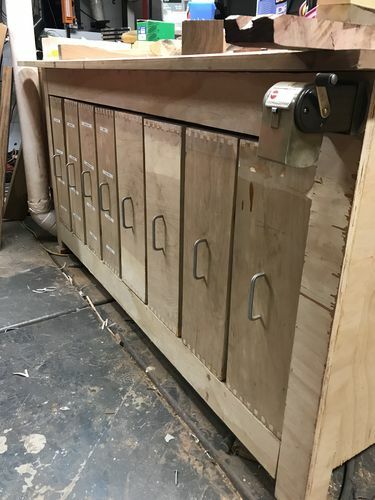 Storage….here’s an outfeed table which was my first project for building out the shop what seems like forever ago. 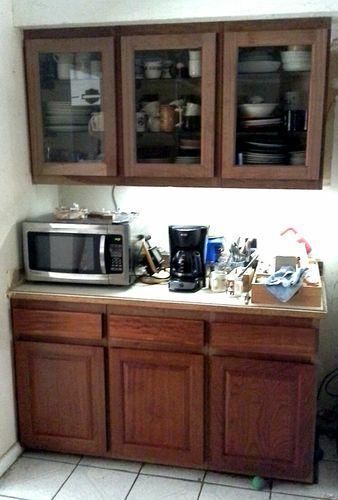 It’s done poorly and used to have a shelf. Was a waste of space. So a long time ago. 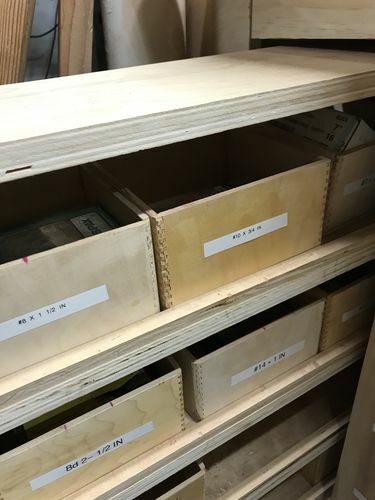 I built out sliding drawers and buckets for those to store this kind of thing. I’m not using as many screws as a lot these guys, not enough for cost to be a concern, but have settled on Spax or GRK. Most common size for me is 1-1/4”. After that probably 2” and 3”. I just use what comes with and seldom have to buy. The spax or GRK screws seem to hold just fine and they don’t strip easily. As many have said, Spax or GRK, I get them at Home Depot. 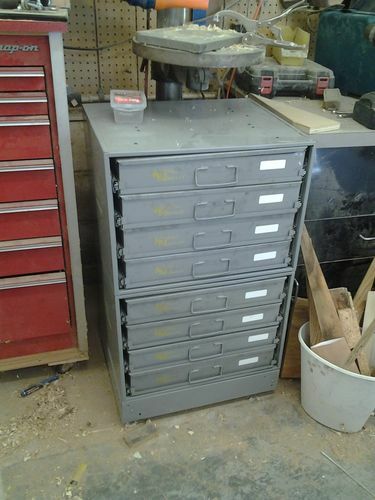 I don’t use a ton of Screws so I don’t buy the really big contractor boxes. I don’t know where you live but there are chains like Ollie’s and Big Lot’s that have drywall screws for a lot less than the $6-7 a pound the box stores charge. Selection is hit and miss though. Thanks for all the replies. I like the idea of the SPAX screws and will definately look into those. 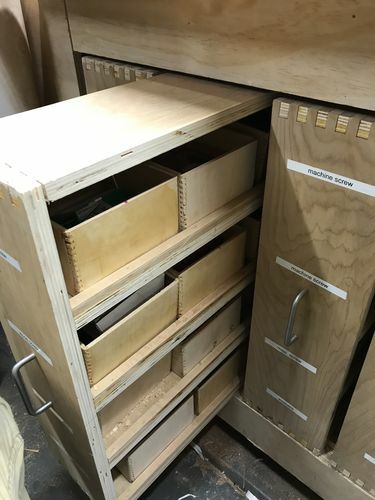 As is the case for me, I usually don’t use that many but in the time of getting the shop set up and building the out feed table, cabinets for storage, assembly tables, lumber rack, and the just completed sheets good rack, I’m lo king at a ton of screws. Of cousre so far the sheet good rack and cracasses for 2 doulbe wall cabinets are as far as I’ve gotten. 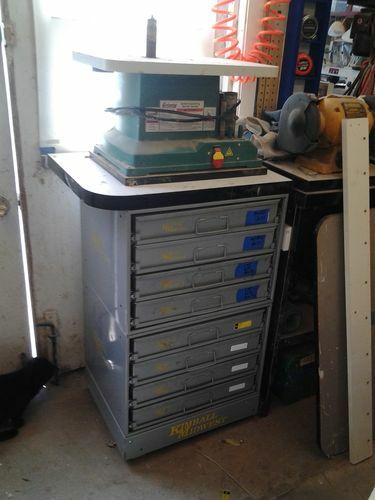 Well add the cordless drill/nailer organizer to being done as well. It’ll be 6-12 months before I get it all set up. I hope the wife never wants to sell the house!